Men from Lipa who escaped Japanese atrocities in 1945. Image source: United States National Archives. The photograph above was of five men who somehow had the good fortune of escaping the Japanese orgies of murder in the town of Lipa in 1945. The original caption mentioned that the men were from a barrio called “Sampaloocan.” This must be Barrio Sampalocan, instead, which was a barrio of Lipa City as recently as 1969. In the present day, this barrio is part of the municipality of Balete, which until the year 1969 was part of Lipa City. 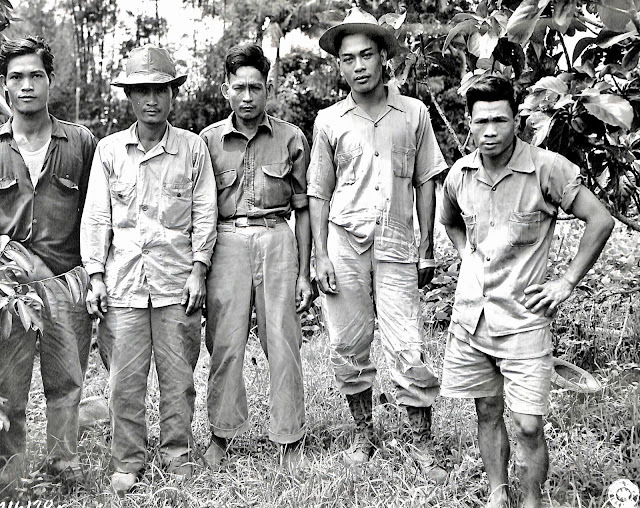 Original Caption: Five men who escaped Jap killing at Barrio Sampaloocan, Lipa, Batangas, P.I. (for Philippine Islands) are left to right: Nazario Marasigan, Sixto Marasigan, Toribio Garing, Juan Litan and Geronimo Biscocho.